Find a loft bed with a desk underneath for a teen, student or to make the most of a studio apartment. Wood and metal options available. A loft bed with a desk underneath is a great option for maximizing space. It works well for a teen who needs their own space to study. The area under a high bed can be put to use with a large desk and room to store text books and computer equipment. If you're buying a new bed for a tween or pre-teen these beds are also worth considering as they'll see kids through to their teenage years. A tall bed with a desk below is also a great option for students and young adults who live in a small space and need room to study or work. You can make a single room or studio apartment much more practical and spacious by using the same floor space for both sleeping and a desk. The beds we'll look at on this page have a large desk underneath a bed. They are like bunk beds, but with a desk underneath instead of a lower bunk. 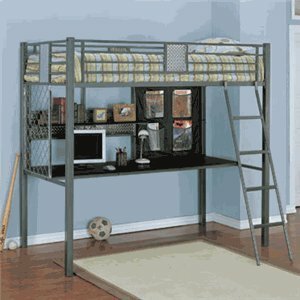 This metal loft bed is made from heavy powder coated tubular steel. The top bunk is a standard twin size. The study desk underneath is included. You also get a large work surface and a storage shelf and mesh storage pockets. The ladder comes out on the front on this bed so you can put it against a wall and have furniture on either side, or have it against a wall on one end. The decorative mesh panels add a bit of design detail. Loft Bed Buying Tip: Make sure that the room you plan to put a loft bed in is tall enough to accommodate it. You want to be able to sit up in bed and easily climb in and out. This workstation loft bed is very handsome. It works well in a modern apartment and is a good choice for a teen or student boy, or a girl who likes things clean and unfussy. The desk is included and you also get a pull out keyboard shelf and a bookshelf that runs the length of the desk. There's a ladder and each end of this loft bed so you'll need to make sure that one of the ends is accessible to climb up. The ladders are at the front of the bed so you should still be able to put a piece of furniture against the wall next to the bed if you need to. Don't forget to buy a mattress for your loft bed if you don't already have a suitable one. A mattress is not usually included. In some rooms a dark wood finish will look better. This twin loft bed has a cappucino finish which will be important if you have other dark wood furniture. As well as a desk and pull out keyboard this bed also has a good amount of storage built on top of the desk. Make sure you consider the position of the ladder on a loft bed. A ladder may be on the end or side. Make sure there will be access space in front of the ladder to climb up. 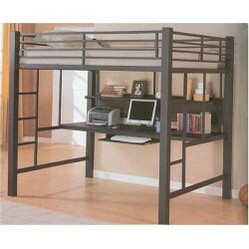 Wayfair have a big selection of loft beds with a desk underneath to choose from. A really good range of teen and college student loft beds in wood and metal. Choosing bunk beds with a futon underneath works well when you need a spare bed occasionally for sleepovers, or to give seating in a small space. A bed with a slide is great fun for kids. Let's look at some fun cabin and mid-sleeper beds with slides for boys and girls. Did you like the Loft Beds with Desks? These are so neat. I have been thinking of getting one similar to this for my 12 year old son. I love how it maximizes space in the room. If you’ve been having difficulty falling asleep at night, it may have to do with the way your bedroom furniture is arranged. Bedrooms are supposed to be calm, peaceful and quiet. If your kid keeps saying “I wish, I want, more than this,” perhaps he wants his bedroom to reflect his love for One Direction. All you have to do is choose some featured products.